Press Release (ePRNews.com) - LOS ANGELES - Jan 25, 2018 - “Now is not the time for cool… Now is the time for action,” says Blood Drive Car Show Producer Trace Edwards. When organizers sat down to develop a new and unique event concept, they focused on a gathering with a purpose that will benefit local communities and the greater society. It quickly became apparent that the nation’s virtually unspoken daily shortage of blood supply for America’s citizens would be a tremendous focus. 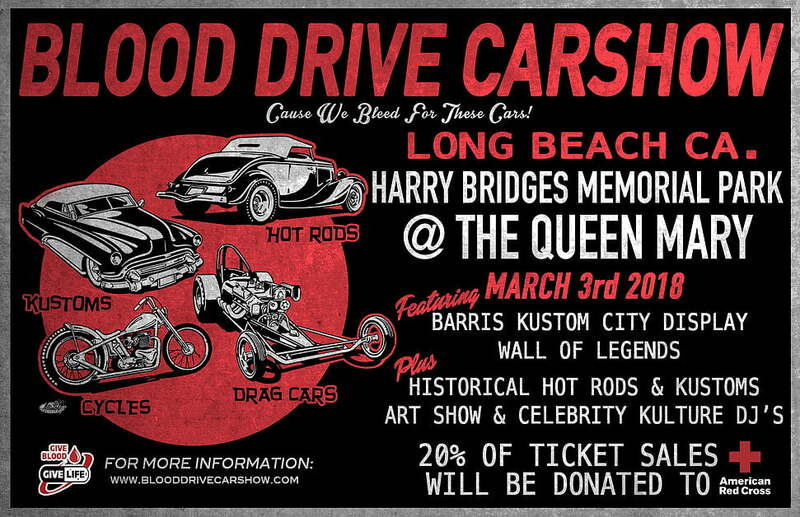 On March 3rd in Long Beach, California, the inaugural Blood Drive Car Show will debut with an amazing collection of automobiles, tattoos, and more. Blood Drive Car Show is partnering with American Red Cross to help keep the blood supply stable and assist in raising financial contributions to help with processing and transport costs. It will feature displays from Barris Kustoms, Historic Hot Rods and Kustoms, a unique Art Show and Celebrity Kulture DJ’s. Now is not the time for cool… Now is the time for action. Blood does not last forever and it cannot be frozen! Blood has a shelf life and lasts only 42 days and Platelets only 5 days. Whatever blood that is not used across the entire medical system is federally mandated to be diluted and destroyed to ensure safe transfusions. Edwards adds, “This means the need for blood is constant and it’s up to all of us – America’s Citizens – to keep the blood supply steady. We also want people to be aware of and educated to the fact that being heavily tattooed does NOT prevent individuals from being a Life-Giving Donor. That is a myth!” The organizers have pledged 20% of ticket sales as a donation contribution.